I’ve been watching The fine bros on YouTube & the “kids react to.” segment always cracks me up, or hits home deep. & then I read a lot of your blogs as well & the things your children say. Now that got me thinking about the fact that as we grow up, we gain knowledge & experience. But, is that really a good thing? Or does it end up clouding our imaginative wonderful youthful minds? I feel it does. Yes, we gain knowledge of history, math, science, or a trade we are going for. But then I feel we lose sight of the world the way it is really meant to be seen. Then I watched This video on kids talking about what they feel that love is & means to them. & it’s just so wholesome & pure & real. & that really got me thinking. As adults we tend to over complicate things. Such the simplest easiest things, we can twist & turn & create our own nightmares. Kids on the other hand. They just see the world so purely. For example, the bus. Which way is the bus going? 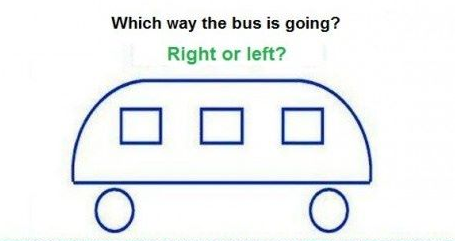 As adults we seem to have just way to much information in our brains that we over complicated it & end up not being able to figure out which way this bus is going. But, children on the other hand, are still so young, innocent & pure that they noticed they cant see the door they enter through. Therefore the bus is going left. Amazing. It’s just the little things in life that always makes me miss being a kid. I wish, like so much of us do, that I didn’t grow up so fast. That I didn’t spend so many hours as a teenager wishing I was an adult. Oh the joys & hardships of life. That video is so cute! Kids see the world so much more simply than we do, don’t they? Great post. They really do, and I am jealous. Oh to be a kid again. Thank you! Great words!! The bus thing? That took me a minute to wrap my head around even after you explained how kids see it! Amazing, not in a million years would I have decided that! I think maybe you’re right! The first time I was told about the bus I felt so silly! To overlook such a detail. Lol.